Hi there, it's been a while since my last post, I've been away from home for more than a month, then I rediscovered crochetting and got a bit addicted to it, but we eventually ran out of my homemade soaps so I ordered some lovely oils and decided to make a couple of batches before it got really hot here in Greece. I've found some lemon essential oil and white (kaolin) clay in a new local store and wanted to add some grounded dry herbs into it so I came up with basil, since I think lemon and basil are a true love match. The rest of it was the basic soap recipe with olive, coconut and palm oil that that I made couple of times already and found satisfying. You can find it here. I've never used this ammount of essential oil in my soaps, since it is a rather expensive addition, but I couldn't resist the idea of fresh, citrus scent of lemon when contemplating a perfect soap for the summer. 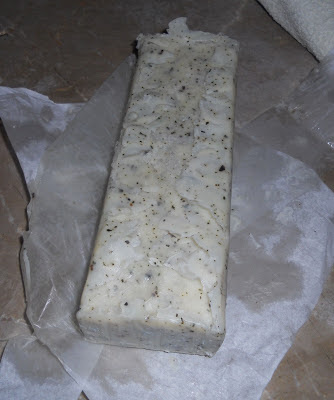 This was also the first time I used clay in my soap, so I did some research on the Internet to see how much clay should be added per pound of oil. I ended up using 2 teaspons per pound of oils. I didn't want the clay to start flying around when I add it to the soap, so when the light trace appeared on my myxture, I took some of it out and mixed it with clay in a separate bowl and then added it together. Then mixed it some more and added dried basil. You don't want to mix basil in with a stick blender because it will clog the blades. I used a silicon spoon instead. Then I poured it into a mold and this is how it looked. I've had soap before that "gelled" a bit in the middle, but never like this and it never changed the outside appearance it. So I ran to this Soap Making Forum for answers and as it turns out the gel phase is not such a bad thing after all, it actually speeds up the process of saponification, but from the esthetic point of view it doesn't help much, so some people avoid it by putting their molds in the fridge. I did put it in the fridge after this to cool down and then left it at the room temperature for the remaining time. Luckily all went well and when I unmolded it, the color was more like what it was originally. So, this is how it looks now. It doesn't have a strong scent of lemon. I used only 5 ml of e.o for 800 g. (1.7 pounds) of oils, since I originally intended to use a smaller mold, but I couldn't find that one for the life of me, so I used a bigger one. My supplier in Greece advises 5-15 g of lemon e.o per 500 g oils. However, since lemon e.o. is phototoxic it might not be a bad thing that I didn't put much of it, because this soap will be used during summer. I has a silky feeling to it and it latheres quite nice too. I might cut some rough edges to smooth the top surface a bit, but that's it. I've learned a lot from this experiment, so I hope you will avoid making the same mistakes upon reading this post. Despite everything, I love how this soap turned out and the fact that I didn't have to wait long to use it, since waiting is not something I'm good at. Thanks for sharing. In the soaps where you have added botanicals (e.g., lavender, tea leaves, basil), have they lost there natural color / turned brown over time? Hi Ana - I love you blog, thanks for sharing! I've only tried adding lavender buds once and the batch was ruined for other reasons :((( , but I haven't tried again. I wonder if added on top and put in the fridge to prevent gel, if the buds would keep their color? What do you think? Hello Angie, thanks for your kind words, I am so glad you appreciate my blog, since I am fairly new to soaping (a bit over a year)! Regarding, lavender, yes, I think that's what you should do, because in my experience, lavender buds that are not immersed in the soap don't turn brown, so I sprinkle them on top. I did this with my Lavender and Mastic soap and they kept their color. Watch out when you cut the bars though, because the buds tend to stick to the knife and slide down scratching the bar. Wow! the soap looks beautiful! similar thing happend with me too, wen i was making coffee cream soap. it got over heated in mold and went through a gel stage but it didnt change the appearance of my soap, all it did ws made my soap bar a lil harder. and according to me, it isnt the clay and EO's that caused over heating because i use EO's and kaolin in almost all my batches. Thanks Amy. Yes, I used clay lots of time in the soap after this and it didn't happen again, it must have been something else. and as u said about the EO's n clay being the culprit, well being a regular user of EO's and kaolin this happend just once with me so i do not think that they are to blame.